After i shifted to Delhi, this was my first bullet trip in North-India.I was super excited to explore the hill stations that been always praised in photographs by many. Start early if you want to avoid the traffic at Meerut and take the Meerut bypass road to save time.You will get eatery points on the highway, so nothing to worry about.But most important thing never ever expect that all who are on highway will follow traffic rules.And this expectation decreases if you are on UP highway 😀 So be careful !! It was around 2 PM we reached Lansdowne, took around 5 hour to reach.We took a buffet lunch at Blue Pine Resort which was 3 km before you enter the town. After Morning Tea we headed towards “Tarkeswar Temple” in Gundalkhet village , 40 km away from Lansdowne. On the way had our breakfast at “Gharwali Inn”. Than the best part of our journey started. 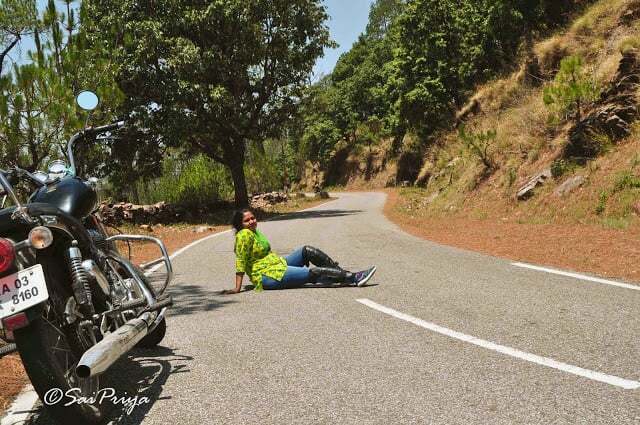 The sunlight seems to dance, to weave with the mountains.We were on the unknown winding roads ,the long pine trees and the fearless adamant rocks were the passerby.No doubt all these sight made me gaze spellbound on the works of the Almighty. After 1.5 hour drive we finally reached our destination.The temple is among magnificent tall pine-trees creating a tranquil atmosphere.As we enter the temple gate ,there are unbreakable circles of bells which were offered by thousand of devotees.This is a place of faith and devotion to lord shiva.It is believed that Tarkeswar ,the evil minded meditated and worshiped lord shiva here for a boon.Every year a grand celebration happen on Maha Shivaratri. Early Morning we decided to go for a trekking to nearby village.It became a cultural experience for us. We were completely immersed in the culture and in touch with the people, environment, and wildlife. The good part of our trek was talking with that local boy, who was guiding us about the roads in the forest .He was happy to explain their culture and the natural history of the countryside. The houses in that village were beautifully made with stones.The blue colored door made me to click a picture with that.The memory of that picturesque village is still vivid.